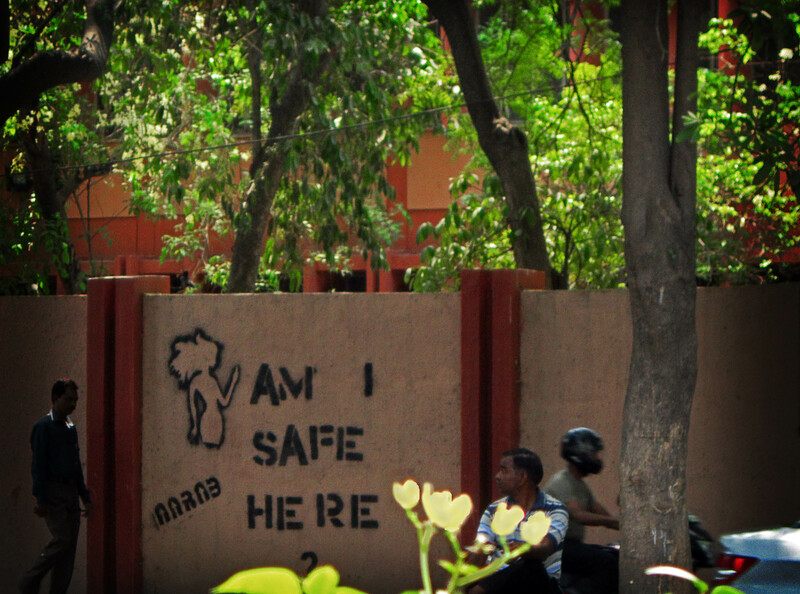 The students at the NGO called Project Why in New Delhi never fail to amaze, enthral and astound those who come from all corners of the world to volunteer. All students live in the slums of southern Delhi, in small huts with little or no amenities, and attend the state run schools, Project Why gives them an extra bit of education. State schools in Delhi are little more than factories to churn out poorly educated citizens to take up the many low-paid, unskilled and lowly jobs it seems the government is happy for them to fulfil, keeping those of lower caste in their place and thus keeping a cheap and compliant workforce. Classes of 120+ are normality; mostly the low-paid and uninterested teachers seem neither to try nor care to make sure everyone is educated properly. Pupils only attend school for half days, boys one half, girls the other so they don’t even get a full day’s poor education and also only get subsidised schooling between the ages of 6 and 14. Not all pass their exams at the end of their school life and few achieve good marks, however those students who get supplementary education and support at Project Why do better than the rest, recently some students achieved highest marks in class and in one case the highest marks in the school. A great endorsement and happy reward for the hard working people who run the charity and teach there, a success story happening right now. This is good news for the able-bodied slum-kids but for those differently –abled youngsters of the slums there is little or no state provision for education or support so it is unusual for any disabled children from the slums to attend school. Fortunately for them Project Why also provides day long care and education for the differently-abled at its Special Section in Govind Puri, South Delhi. So at least a few students will be competent in maths, written and spoken English and written Hindi too, as well as learning life skills they would otherwise not be given in their slum homes. One such student is Preeti, a victim of Polio at an early age she can only walk on her haunches by moving her feet with her hands, nevertheless she rarely accepts any help and is quite clever too, with an ability and a willingness to learn that is quite extraordinary. There is a possibility she might be able to pass the school leaving exam and so have the certificate she would need to get a job otherwise she would stand no chance of employment at all. To do this she needs to learn a great amount not least to be able to know her way round a computer, something totally unavailable to her living where she does amongst the slum huts, no family there can afford a computer and certainly there would be no internet connection. One skill very useful to her would be being able to type proficiently, at speed and accurately, an added asset if she were to apply for employment and also enhance any time she spent on the computer while at the Project Why class. So a pet project has begun to teach Preeti to touch type and also for this one-finger typist to learn along with her. Finding and downloading free software was the initial task as we cannot afford to buy expensive programmes at the charity, the first attempt ended on lesson three as the supposed ‘freeware’ ended there with popups to buy any further use but the second attempt, with Typefast, is proving much better and really is free. Preeti took to learning touch-typing quickly and vastly outpaced her tutor, who has been left in her wake, such is her ability to learn, her dedication and her concentration. Her pace of learning is astonishing and she usually has only to be shown something once to have learnt it and remember it days later. Not long after her lesson today there was one of the many and common power cuts leaving the class without a fan cooler for the whole afternoon. Not so much of a problem except it was the hottest day of the year so far at 48 degrees Celsius or 118 degrees Fahrenheit, in old money, not helped by the humidity going up to over 30% and the classroom being at the top of a four story block, whose flat roof is baked by the sun to higher temperatures. Five minutes outside in direct sunlight is enough to melt anybody into a jelly. Relief comes to Preeti’s tutor at home with aircon and cool, clean, clear water on tap but one can only wonder how she and the rest of the slum families cope in their little one room, tin-roofed homes with only water collected from the communal tap in plastic jerry cans, if it is working, otherwise waiting for a tanker to deliver and fight for a ration. But cope they do with little complaint. The next day Preeti is back at Project Why, fresh as a daisy, eager to carry on her typing lesson. 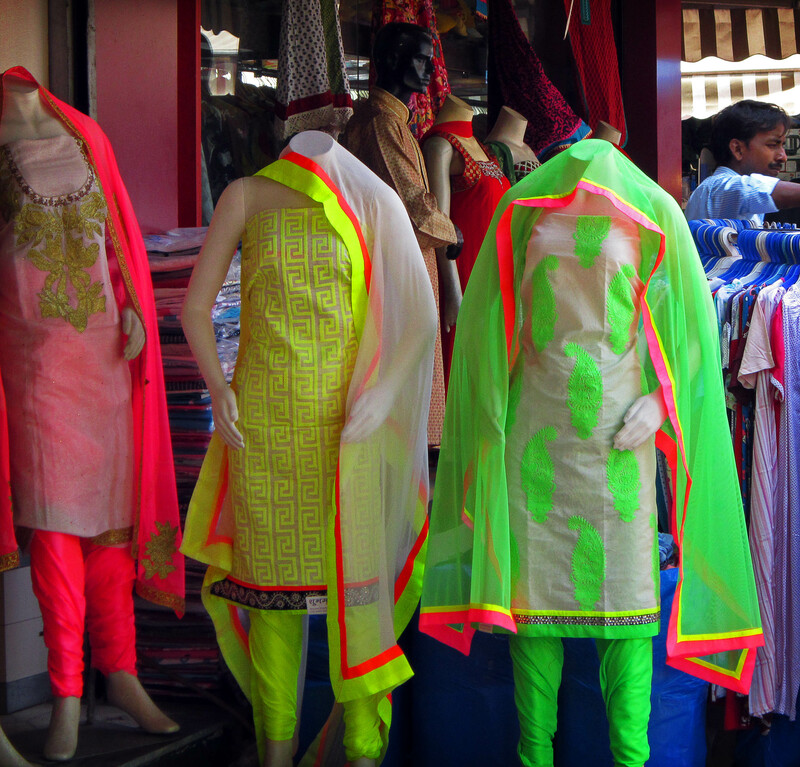 Like a throw-back to the 1990’s rave culture in Europe, day-glow fashion for the daring young Indian women. Is this the latest vogue for Delhites or someone’s mistaken idea of new fashion, copied from an old magazine picture and merged with traditional Indian garb? Back in 1990’s illegal rave culture in the underground scene these would fit right in, during the heyday of Ibiza clubbing they would not be out of place, indeed had a raver worn them they would be admired and applauded for going the extra mile and brightening up, dancing under the ultra-violet lamps, glowing luminosity. Outside a boutique in Central Market, Lajpat Nagar, New Delhi, they certainly attracted attention to the shop’s interior but alas these were the only such clothes of the mode. Though bright, colourful and beautifully adorned clothes are the norm in Delhi for lots of women who haven’t succumbed to western fashion trends, these clothes are the brightest seen anywhere. Sadly and, most probably, luckily there were no male clothes of the like or a sale might have been made. A girlfriend lets out a sigh of relief for the ostentatious boyfriend with little fashion sense. Have You No Mother Or Sister? 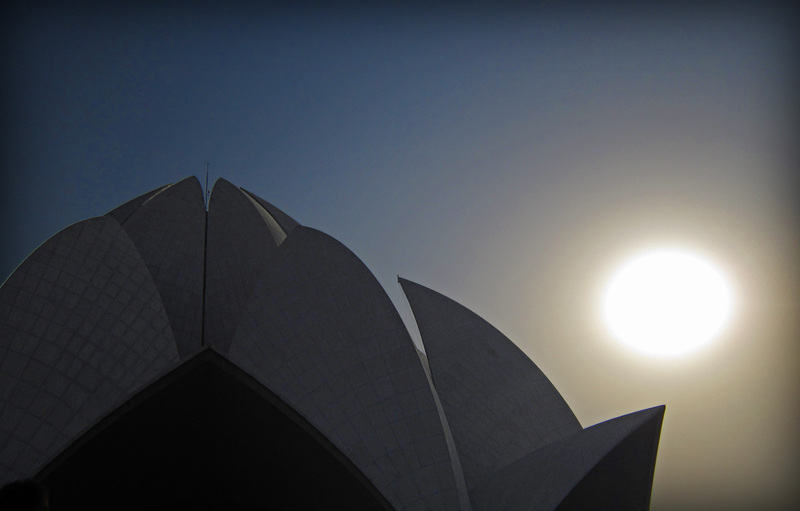 The Lotus Temple to the Baha’i’s faith in southern New Delhi, concrete flower blooming out of the murky haze of a frantic city. Thousands visit everyday grazing through its gardens, corralled into lines outside a door, as one herd is silently herded out another door, the new herd gestured to sit, mute, within stark and barren petals rising high, one central, golden emblem the only relief atop budding roof. Two modest arrays of flowers, dwarfed in the cavernous space of the giant Lotus, the only concession to the monotony of white, marbled floor to break up the semi-circles of hundreds of plain chairs. An oasis of calm, silence and bemusement for tour buses’ herds. Beside the Lotus, a visitor centre, the only attraction, no other thing to see amidst acres of flat, untraversable grass and flower beds. To, perhaps, shine light on, enlighten and explain who, what, why an empty and silent flower exists. The Bahai’s accept all religions or none, reject none or all, within the temple any scripture or holy book may be read aloud, hymns may be sung but nothing else is allowed to be said, no sermons read out, no instruments played to accompany song, no discussions of faith and absolutely no rituals or ceremonies performed. Would pagan verse from Europe be allowed to be read aloud is a thought or indeed would the Book of Jedi? While accompanying two, young German women, volunteers from Project Why NGO, around the visitor centre, an elderly Indian man approaches, friendly, offering his hand in a warm gesture to shake, asking ” Where are you from?”, England and Germany the reply. Next he enquires ” Are these your wives?” …………err no just friends. A joke, it must be as he smiles broadly still shaking hands, then leans forward close to the ear and says ” I will give you Rs1 Crore for them”…………ten million Rupees! Rather shocked and sure it must be still a joke, English politeness and embarrassment takes over. No, no, no, ha ha, nice to meet you, goodbye. Extricate hand, wave goodbye just so he gets the message, turn round so he gets it for sure, a bemused trio stare at each other in wonder about what just happened. Laugh it off, talk about it later as a funny incident, but it sits uneasily, Should a joke be taken with good nature no matter what the subject? Was it, is it, harmless? Should such talk be accepted in a strange, foreign land where tradition and manners are very different from Europeans are used to? There is now one European man whose mind has grown a little more for the better, with an understanding of the reality, a damn fool no longer, when presented with the unacceptable, upon hearing verbal distastefulness is armed and ready with the perfect and instant reply.